The best part about the #wherethewhitewomenat hashtag is that it was most famously said by a black man trying to bait KKK guys in Blazing Saddles. 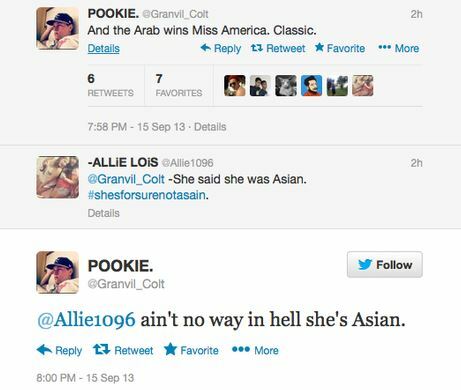 So basically, in an attempt to be racist, they quoted a person of color who was mocking racists. When I first read some of the tweets about her, I wasn’t sure whether to feel angry and frustrated or just plain surprised at the stupidity of some who were calling her arab and about 9-11! I mean if you want to be racist atleast get your facts right!! On a lighter note, “before I explode into a cloud of rage and glitter” is my favorite phrase in this entire post. Good post. I was disgusted too! America is suppose to be about freedom from persecution, but look at what these people are doing. I don’t care if they are black, white, or Indonesian, as long as the girl works hard and respects others, good for her! Preach! Couldn’t agree with you more. People are such idiots – uneducated, ignorant, and stubborn. But Nina is a very classy, beautiful woman and she handled this very well. Beautiful! (The girl and the post). Really hits the nail on the head. I love a fellow ranter. 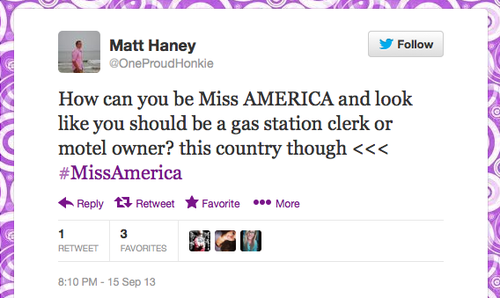 This blog post about Miss America (which is kind of like a one time a year reality competition show) is awesome. Wow … you walloped the pinheads and I love you. Good on! Frankly, you impress and amaze me. Well said. Your use of sarcasm aided your point in this blog post, Alex. Same as you, I find it hard to believe the narrow-mindedness of some people. Many people call the United States a “melting pot,” which is great! We have a lot to celebrate with diversity in thoughts, ideas, culture, etc. Recently, there was a Coca-Cola Super Bowl ad that had similar reactions. I couldn’t believe it! I’m sure you’ve seen it, but it was “America the Beautiful” sung in eight languages, all with different ethnicities. Negative comments spread like wildfire on social media…What I’m wondering now is, what were the repercussions for the Miss America Pageant organization?